Five years ago, Alida Ryder of Simply Delicious did not know what food blogs were, let alone think about starting her own. What started out as a way for her to record and share recipes with friends and family in other cities has grown beyond her wildest dreams and today she is one of South Africa’s most popular food bloggers, with a recipe book in print and a hugely talented food photographer and stylist. Let’s get to know her a little better. I live and blog in Pretoria, South Africa. Since October 2009. It started as a way for me to give my family and friends my recipes, and has now turned into a full-time job. I think I enjoy reading other people’s blogs the most. 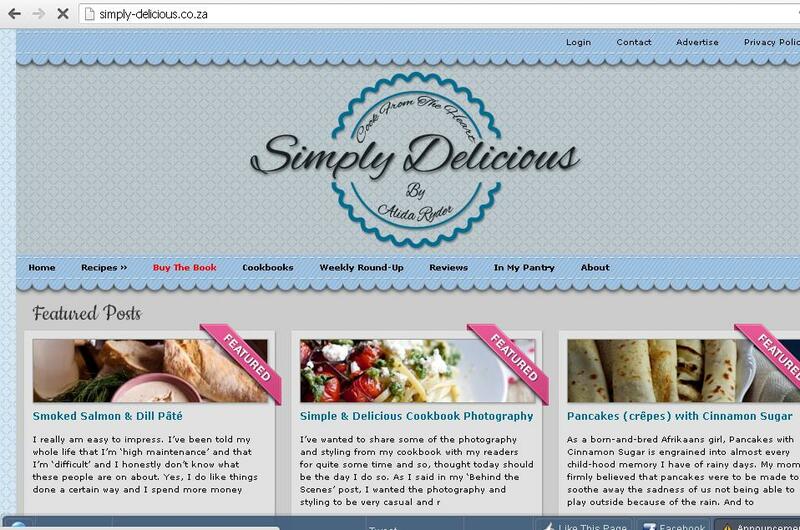 As well as getting the comments about my recipes and photography. It’s really great to see people trying your recipes and really loving them. I love working with fresh, seasonal produce and when I see something in the grocery store ideas immediately pop into my head. I think the people that inspire me to cook are definitely my family and they are very happy to be the taste-testers. I write my blog posts in the morning after I have breakfast with the twins and I blog from the office I share with my husband. I think I’m too young to have a signature dish but I am constantly asked to make my cheesecake/brownies/condensed milk tart so I guess for now, it must be one of those. I’ve grown to enjoy wine over the last few months and I must say I’m really enjoying Kleine Zalze’s Sauv Blanc and Adoro’s Mourvedre. I adore reading the inspiring What Katie Ate, Not Without Salt and Always with Butter. In Pretoria it’s definitely Kream. By far the most beautiful restaurant I’ve EVER seen and the food is to-die-for. In Cape Town at the moment I’d have to say Wafu because I’m going through a bit of a Dim Sum phase and their Crispy Prawn Puffs are addictive! It would be a VERY long meal. Buttery Bruschetta with fresh tomatoes & basil, Butternut Risotto with Feta & Chilli, Oxtail potjie, Prawns with peri-peri sauce and end the meal with a giant bowl of Creme Brulee.